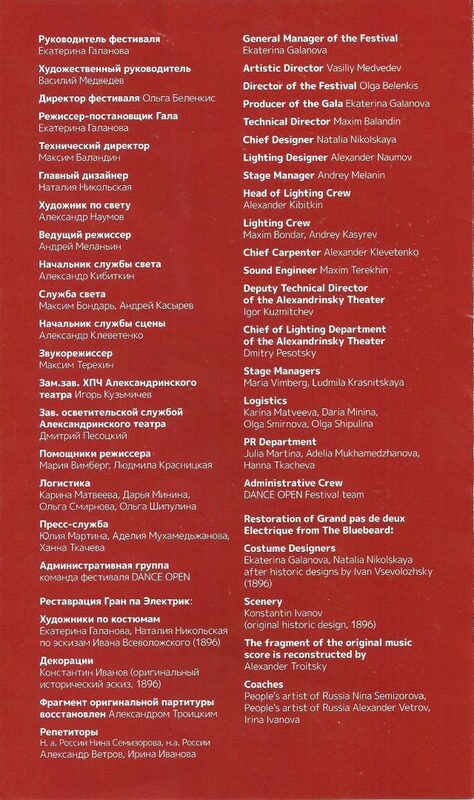 Dance Open 2014 ballet festival in St Petersburg, Gala concert program. 17 Yolanda Correa, Joel Careno and corps of Yakobson Ballet in Diana and Acteon Pas de deux from Esmeralda. Music by Cesare Pugni, choreography by Agrippina Vaganova. 18 Adrienne Canterna, James Boyd, Angelo Corrigan, Robert Nicholson and Timothy Olson in Rock You. 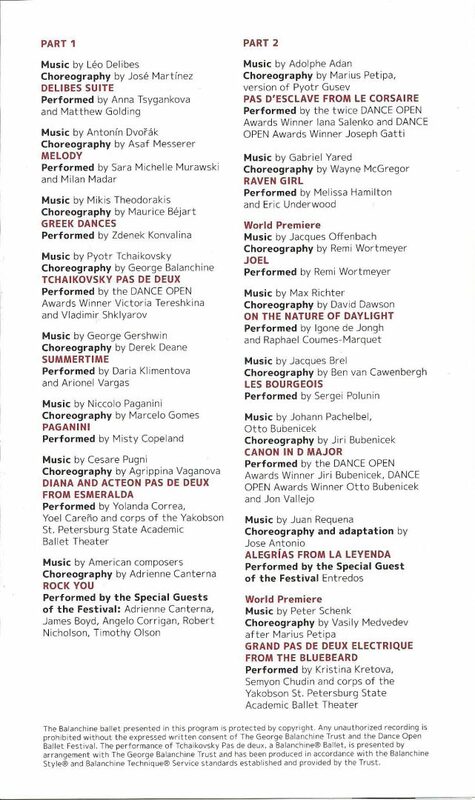 Music by various American composers, choreography by Adrienne Canterna. 21 Iana Salenko and Joseph Gatti in Pas d’Esclave from Corsaire, music by Adolphe Adam, choreography by Marius Petipa. 22 Melissa Hamilton and Eric Underwood in Raven Girl, music by Gabriel Yeredm chorography by Wayne McGregor. 23 Remi Wortmeyer in Yoel (World premiere), music by Jacques Offenbach, choreography by Remi Wortmeyer. 24 Igone de Jongh and Raphael Coumes-Marquet in On the Nature of Daylight, music by Max Richter, choreography by David Dawson. 26 Jiri Bubenicek, Otto Bubenicek and Jon Vallejo in Canon in D Major, music by Johann Pachelbel, choreography by Jiri Bubenicek. 28 Kristina Kretova, Semyon Chudin and corps of the Yakobson Ballet in Grand Pas de Deux from Electrique from the Bluebeard (World premiere). 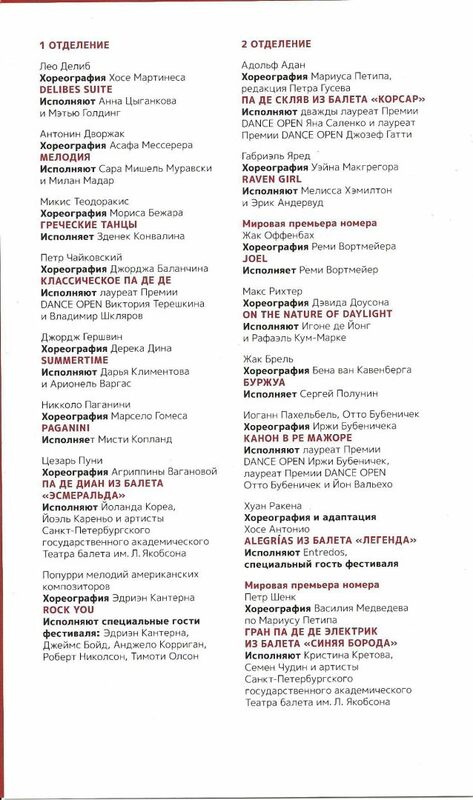 Music by Peter Schenk, choreography by Basily Medvedev after Marius Petipa.